Photograph of Bob Iger, CEO of Disney taken for Fortune in NY. Scene with Millennium Falcon in Pinewoods Studio, Buckinghamshire, England, is a composite image created by Industrial Light & Magic for Fortune. For the uninitiated, the spacecraft made its debut a long time ago in a galaxy far, far away—the 1977 Lucasfilm flick, Star Wars Episode IV: A New Hope, where it was manned by smuggler Han Solo and his hairy co-pilot, Chewbacca. In December 2015, an updated version of the Falcon will make its appearance in the much-anticipated seventh installment of the Star Wars series, The Force Awakens. The movie will be the first feature film to come out of George Lucas’ empire since Disney bought Lucasfilm for $4 billion in 2012. In late November Lucasfilm posted a minute-and-a-half-long teaser trailer of the new movie on YouTube. It has since been viewed over 51 million times. The teaser shows a brief glimpse of the updated Falcon (along with a much debated, newly designed lightsaber), but our issue provides the first close-up shots. 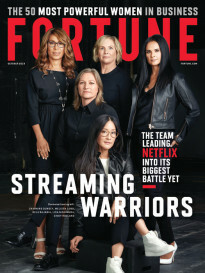 Lucasfilm’s special effects division, Industrial Light & Magic (ILM), worked with Fortune to create both the cover and opening photograph in the story, an inside look at the innovative technologies used across Disney’s diverse businesses and brands. The collaboration started with our photo shoot with CEO Iger earlier this month in New York. The photos were then turned over to ILM to, well, work their magic. Not surprisingly, the secretive division was mum about the exact process for creating the realistic shot of Iger standing right on set, casually leaning against a chunk of metal (the image seen in the opening pages of the story). As for the cover shot, Yannick Dusseault, visual effects art director for The Force Awakens, and his team gave Fortune six options showing the Falcon in different ways. The resulting image required the custom rendering of ILM’s computer generated Falcon. According to ILM, the fabled ship was rendered in wireframe form (a skeletal version) as well as a more layered “textured render,” which were combined in Photoshop to create the final image. 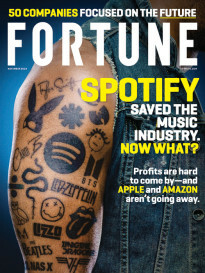 The resulting cover is one Fortune founder Henry Luce probably couldn’t have imagined over eight decades ago. But whether you read the story online or in print, the mashup of Iger and the iconic spacecraft is emblematic of the times: Like all entertainment companies, Disney, which has been around even longer than Fortune, has had to out-innovate itself time and time again. As the lines between technology and pretty much everything else blur, even cutting-edge ILM has had to constantly up its game. The updated Falcon—and our cover—is a testament to that evolution.